The Princess will be playing at another restaurant this Friday night. It has the same name as the one she has been playing, but in a different town about 30 minutes away. Apparently, the family owned all three of these restaurants but the one closest to us was sold to a man (friend, probably, or family, I know not) but the menus are the same. My husband approached the owner of this one when we ate there on Sunday afternoon while the Princess was at a park for a youth cookout event. However, it was brought up in the conversation that the restaurant is not member of a PRO, so if they should come, the Princess would not be able to continue playing. 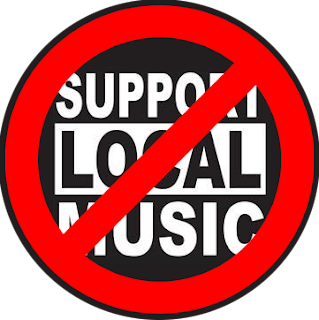 All this week I have been trying to understand what performing rights organizations (PROs) do besides strong arming businesses offering live music to pay yearly fees. Now I understand a bit more. It is supposed to be about songwriters' getting their fair share of royalties and while I am for that, I am just not convinced that PROs really do work in their favor that much better as they claim to do. Not only do some charge a fee to the songwriter to become a member but they hold the venue responsible for the music played because a PRO charges fees according to capacity, as in how many people would possibly hear the music. The restaurant is suppose to pay a yearly fee to display a sticker around the entrance and so that music within the repertoire of whichever PRO the restaurant chose can be performed. Now here is the ironic part: The Princess has been playing classical music written before 1922, that is before copyright law protected music. She did play about three or four songs that would be considered protected by copyright, so we have eliminated them from her list. The songs that are considered public domain are ineligible for any PRO repertoire. I had been encouraging her to learn more modern and better recognized songs, but now we know that is not in the best interest of keeping her venue. So even if another musician plays copyright protected music and a PRO tries to come down on the restaurant, the Princess can legally still play there because we spent Monday afternoon making a list of all her music to prove that she will only be playing public domain music. That gives her more marketability for small businesses that do not really have music as focal point to bring in business as would a bar with a dance floor. However, the PROs like to pressure the restaurants even if all the music performed there is not under their protection, because someone may play a song that is and the worse part is if songwriter is in one PRO, he or she cannot be in another, so the venue basically is pressured to be in all of them. Besides that I think the fees are a bit steep because coffee shops and small family restaurants offering a corner for budding musicians are really not into making money off the music and rarely pay the musicians. I talked to the Princess' piano teacher about this and she said she played for years in a coffee shop and just played whatever she wanted without a problem. I mentioned that we are kind of out in the sticks so it probably is not as well monitored around us as it would be places like New York City and LA. However, ASCAP has an office in Atlanta and has been known to hire music teachers to sit in just waiting for any song that would be a violation. Also, it seemed to my husband that this restaurant owner has run into this problem previously or knows someone personally who has. So, we will try to stay outside of their domain and keep with the classical and public domain songs with our list handy and give a copy to the restaurant for their records. The few newer songs that the Princess has learned have not been popular for several decades and the songwriter would not be making anything from them even with a PRO, which is why I wonder how they really make sure songwriters get their share. Of the four PROs in America, they all have their own structures for fee and membership pay outs some with a minimum, but basically songwriters and publishers only get a share of the fees based on how popular the PRO thinks the song is, as in how much it is played on the most popular radio stations. We had a couple of copied copies of those public domain songs, but to make this completely above board, we are going to be looking them up to be printed off fresh to avoid any publisher's rights as well. And all this so a young lady can play a little piano and earn a bit of change! I have to make a note here that I find to be a bit of history that I just learned. One of the PROs tried to double its fee in 1940, which ended up in a radio boycott of all its music, including promo jingles! The radio broadcasters wanted to prove a point, the songs were popular because they were being broadcasted, not just the other way around. (Remember this was decades before the Internet and any portable recording devices.) During the boycott though, music that was beneath what a PRO would accept was used and at the time they were called such unPC terms as "hillibilly" and "race" and foreign as well as public domain traditional songs, but people actually began to like country, blues, jazz, and ethnic music. Radio broadcasting companies made their point about how much they influenced the music industry, so the PRO came to an agreement with lower fees. I think the PROs model is antiquated when we consider how well we are connected the Internet today and that there should be a simpler and more efficient way to pay songwriters. Performers know what they are going to perform and where, and the venue can provide them with a number of seats. It seems to me that the PROs could be sure to pay the songwriters and publishers directly for actual performances instead of collecting a blanket fee, from which less popular songwriters do not see a penny, when their songs could be rather quite popular with pockets of local crowds. I know it would be more work for us on the performers' side, but I think the performers should be the ones to pay the fees directly and let capitalism work. It could just be pennies, but it is just like the 1940 radio broadcasters boycott proved: songwriters do not make money and become popular when their songs are not performed, so unless the song was rather popular, songwriters would probably offer performance licensing at lower rates to get more play and then they can raise the fees if they like. That is the only way songwriters are actually in control of their copyright. I think PROs acting as the music mafia is actually damaging making those small venues disappear where the direct pay model would encourage more businesses to offer live music, instead of clamping it down so hard that everyone is afraid to whistle a tune. One PRO even went after the Girl Scouts for singing campfires songs in 1996 and forget about singing "God Bless America" in public! I mean, really, where does it end? What if I am humming a tune under copyright while shopping in a store? Can the retail store be sued for that? It is just easier for a PRO to collect from a business or club than individual performers, but it is an outdated way to do it. I would happily pay composers directly a fee per use and develop a relationship to help promote their music if they would reject the PROs. From what I am reading on the Internet, I think other performers would also, but then there will always be some that do not bother to pay. Still, it would not be any worse for the ones lesser known who the PROs do not pay anyway, even though their song is performed. This is one of those times I want to fix the world, but it has become so convoluted that I also think it would be better to burn it and start over...but then mankind being what it is, the world arising from the ashes of the old would most likely have all the same elements that destroyed it. There is far more behind the scenes than we first thought, but I thank you, my Lord, for guiding us and preparing us for what may come.